Just saw where the scarab lineup will now offer the new rotax 1630 ace engine with 300hp. In single or twin setup. Any official word from Scarab/BRP in US? I'll ask my rep from RecBoats today....she's in town and bringing me a couple of freebies they owe me. I can confirm the single and twin 300 engines in the MY19 Scarab production. But, details are still in the process of getting released. I will post some updates as I hear. I wonder if chaparral will offer these as well? Cant imagine a 600hp 26ft jetboat. WOW! That's an awesom news, thanks for the scoop. Imagine 600hp in a 21 or 22ft jetboat ... that would be insanely fun. Lakes will start to be getting smaller at that speed LOL! Other sources are also starting to chime in with the same news. Just picked up my Chap Vortex VRX with twin 300's this weekend. It is a beast. Still breaking in so haven't tested to it's fullest. Nice!! In the 22 footer.. even better lol. I have twin 300's in the scarab 255. Some advice.. I took my boat out for the first time last week ( was bought from LA and had 1.8 hrs on it from some test rides at a Lafayette boat show and my test ride and another person that test rode it and couldn't get financing) . Break in on the engines is about 3 hours - my engines gave full boost at around 2.8 hours. You will definitely feel it when it happens. The engines all of a sudden just breathe and you feel the power. So - I'd bring on the boat with you a small socket wrench that has the 1/4 inch socket and an extension ( for tightening the wormdrive type clamps that are on every hose on each engine). A hose blew off my port side blower rendering the engine to not make any boost. For anyone not experienced at this or understanding that it is not a big deal - they could freak out and think that an engine blew up or some catastrophic problem. When I had the clamps checked - there were 4 clamps in other areas that were loose. Now... if one of the small clamps that bring in water to feed the cooling process of the mufflers/exhaust - that could have been a much larger problem.. Once these clamps were tightened down and gone through - the engines run great and the boat flat out flys.. Curious to know if your engines below 5,000 rpms are far apart rpm wise. My two engines - when under 5k ( and yes the twin engines button is pushed on, and the Engine Synch button is on) the engines can sometimes be as much as 800 rpms apart. However- once engines go in boost, they are perfectly aligned and at same rpms. The Cruise control works great, and all is very comfy. 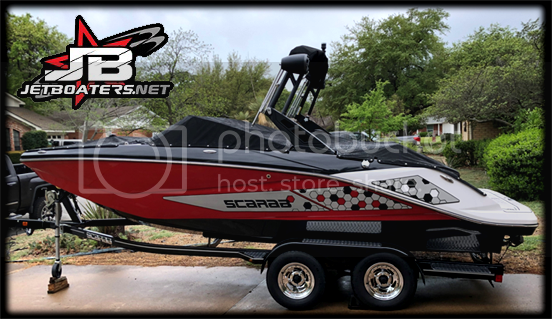 about only complaints that anyone can really have with this boat are the usual things -- loud engines compared to an I/O or today's new outboards, and the low speed maneuvering ( looking at the Cobra steering upgraded fins potentially to help with the low speed steering. That is really the main thing in these boats - the low speed handling is sucky even for the best most trained jet boaters. If it's windy - good luck keeping it straight. I'm hoping that the fins will really help that a lot. Good luck and congrats man! Thanks for the suggestions. I'll take a closer look at the engine sync and keep you posted on our progress. My Twins are not the same RPMS. They fluctuate between 500 and 800 apart rom one another. Just turned 3 hours. cool. thank you. Was wondering if it is normal. Was told by dealer who talked to Scarab that it is normal.